I like that finite world ref, MM. Good article. Pawns in the Game, by William Guy Carr. Published 1955, Carr was a Canadian WWII naval intelligence officer who spent 40 years researching why, despite technological progress, the world was not prospering. Thanks; will look up the reference! I agree, but in the long run, it won’t matter. Whether Greece leaves the EU this week or later this year, after a more protracted process, the EU is still unsustainable. 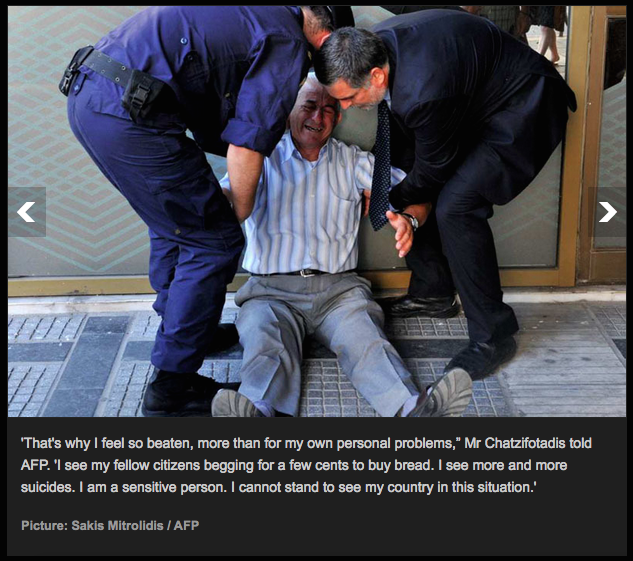 Greece is just a foretaste, there are plenty of other countries in the same situation. I’ve had ideas about this for sometime, but I recently read a piece of research that crystallised my thoughts to the extent that I’ll stick my neck out enough to predict a time-line. Sometime next year there’ll be a crisis in the bond markets, leading to sovereign defaults, the other Mediterranean countries probably first, then spreading to the larger World economies. The following year (2017), geopolitical tensions caused by the above will lead to conflict in the World’s hotspots, these will rapidly spread into wider conflict (I think you know what I’m talking about). I’m not the first person to make this observation, but I mention it for a reason. I think you all need to prepare for the above and it is my fondest wish to see you all here on these blogs afterwards, safe and sound. Let’s face it: we all compete for scarce resources, but when countries lose the ability to pay for them, they’ll try to obtain them by armed conflict. You may think I’m a rambling lunatic, I hope you’re right. There are others who think that the world as a whole is in a very precarious situation, primarily but not exclusively because of the levels of un-repayable private and state debt now endemic across the globe. Throw in the derivates markets/liabilities, the unfunded liabilities (pensions and the like) and you have a recipe for disaster – possibly unprecedented. Add to this the Limits to Growth (http://tinyurl.com/olad4gk) scenario and we really are talking unprecedented. Sure, some/many/most folk consider this type of talk to be hysterical doom-mongering. For me these matters are more of historical and scientific interest. I’m fascinated to think that we’re living through a period of societal collapse. It’s interesting to contemplate what the characteristics of the collapse will be as the years unfold. Texts on this matter include Tainter ‘The Collapse of Complex Societies’, Diamond ‘Collapse: How Societies Choose to Fail or Survive’, Orlov ‘Reinventing Collapse’, Martenson ‘The Crash Course’, Kunstler ‘The Long Emergency’, Michael-Greer ‘The Long Descent’, Heinberg ‘The End of Growth’ … and more. Like I said, my interest in this matter is not at all morbid. I’m a scientist by university education and have a character rather like Mr Spock: I find it interesting to read the runes of societal collapse. There are others, of course, who argue that we’ve never had it so good, the outlook is rosy and it won’t be long now before we arrive breathless and content on the bright, sunlit uplands. That’s interesting too. I too have read a very sane analysis that comes to much the same conclusion: a world-wide financial collapse is predicted before 2020, that will make the 2008/9 crisis look like a tea-party. Just look at the financial news from China. May I strongly recommend that readers find a copy of The Tainted Source, by John Laughland (pub 1997), detailing the undemocratic (and deliberately passed over) origins of the EU. There is a great deal to make your hair stand on end – especially the carefully noted statements about the need for a single European entity from Nazi sources which could have been issued yesterday by the likes of Junker. Thanks sm. I’ve just been over to Amazon to look it up. Other essential reading for gathering the truth about the EU should include Booker & North ‘The Great Deception’ and Craig & Elliott ‘The Great European Rip-Off’. ← PERHAPS EUROPEANS ARE WAKING UP?